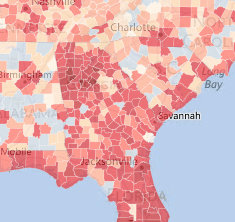 If you want to see a great visual of the U.S. housing crisis, click here for Zillow’s interactive map using county by county data to determine percentages of mortgages with negative equity. Such mortgages are commonly referred to as being underwater; such borrowers owe more than their properties are worth. Please note that all percentages cited here and in the data are reflective only of the pool of homes that have mortgages. About a third of homes in the country do not have mortgages. If you’ve been wondering why economists and economic commentators like me have been predicting such a slow recovery for Georgia, just consider all the drag that these numbers create in local, regional, and state economies. Here in Georgia, we had irrational enthusiasm for housing and a wild west banking system, compounded in the years since the bust by no proactive policies at the state level and by ineffective policies at the federal level.